Many VPS and dedicated server users have cPanel installed as their control panel. Therefore, it is very useful to know how to create backups of your website or entire server using cPanel. Follow these instructions to make your backups. There are several backups to choose, all of which will download the files to your computer. If you want automated scheduled backups and/or remote backups, choose another option. 3. 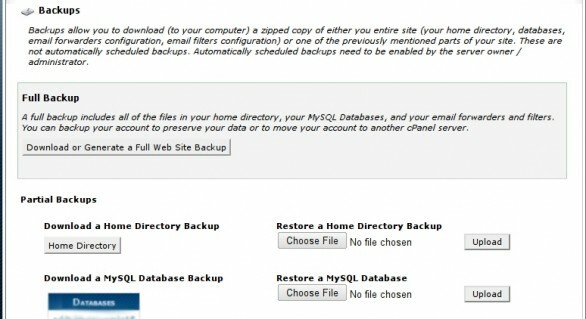 To generate a full backup of your website, click the first button. Optionally, you can choose to backup only a portion of your site, such as home directory, MySQL database, email forwards, or email filters. 4. Click the button of the component you want to download. Your browser’s save dialog should appear offering you a file in tar.gz format, which is a commonly used Linux form of file compression. Backups are very important, and if you are unable to schedule routine automated backups, this convenient manual backup is a good option.